Chichester-born-and-bred jazz pianist Zoe Rahman takes to her home-city stage alongside Courtney Pine as part of the new Priory Park Festival, at the heart of this year’s Festival of Chichester. Courtney and Zoe will deliver their acclaimed celebration of timeless classic songs The Ballad Book on Sunday, July 10 at 8pm (tickets on www.chichesterlive.co.uk). “I have worked with Courtney for about six or seven years now,” Zoe said. “I stood in for another piano player on tour, and Courtney asked me to play on his album Europa. And then I toured with him about five years ago. And then a couple of years ago, he said ‘Do you want to do a duo album with me?’ I said ‘Are you sure?’ He said yes. I had just had a baby at that time (Zan, named after her late father). “And so we did the album and Courtney said ‘I probably won’t tour it’. But we have been touring it for the past two years! It’s his own album, an album of ballads and songs that have a lot of meaning for Courtney. He is playing bass clarinet, and this gig will be just bass clarinet and piano. “Courtney has got a real mix of things on the album, things like A Nightingale Sang in Berkeley Square. There is also Amazing Grace. It is a range of things. There is no singing on it, but for Courtney it is about the lyrics that have meaning for him – even though we are doing them as instrumentals. “It is his album and his concert,” says Zoe who was born in Chichester to a Bengali father and an English mother. She went on to study classical piano at the Royal Academy of Music, took a music degree at Oxford University and then won a scholarship to study jazz performance at Berklee College of Music, Boston. “With this gig, I just come on and play the piano. But it was so nice to do. We recorded the album in a couple of days, before we toured it. But doing the album live now will be very different in terms of feel. I love it. Courtney really pushes me in ways that are really great for me. “He is really great to work with, a really interesting project just the two of us. There is no one else on stage to fall back on. It is just me and him, and it is lovely. We have great discussions on the tour bus about music and about the jazz scene, what we are listening to, about making albums. He has made so many albums. We share ideas about that kind of thing, and it is great to have somebody who is supportive of me. Aside from working with her own groups, Zoe has toured and recorded with a diverse range of other artists, including: George Mraz; Courtney Pine; Jerry Dammers’ Spatial AKA Orchestra; Danny Thompson; Martha Wainwright; Soothsayers (with reggae legends Johnny Clarke and Michael Prophet); Larry Stabbins; Clark Tracey; James Carter; Natacha Atlas; Keziah Jones; Mekaal Hasan among many others. She has been a featured artist on numerous TV and radio programmes, including BBC4 (Women in Jazz; Way To Blue: The Songs of Nick Drake), BBC2 (Jools Holland; Desi DNA), Channel S, Bangla TV, Meridian TV, BBC Radio 4 (Front Row, Woman’s Hour, Loose Ends) BBC Radio 3 (World on 3, Late Junction, In Tune) BBC Radio 2 (Jamie Cullum, Jools Holland, Courtney Pine, Charles Hazlewood). She is often invited to sit on high-profile panels – most notably, the Mercury Music Prize. 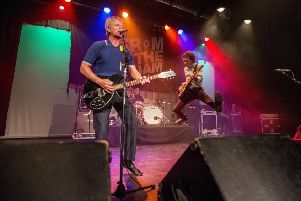 Tickets for the Priory Park Festival are available on www.chichesterlive.co.uk.